Kitesurf attitude is a kitesurf school in Nouméa on the beach of Le Méridien hotel. Affiliated to the French federation of free flight since 2000, our school is labelled French school of kitesurf / EFK: the best quality label ever ! ( see on the French federation free flight sight). The courses take place on the islets of the south lagoon ( îlot Maître and Goeland ) only 10 to 20 minutes from our nautical base, which is situated at the foot of Le Méridien hotel. Those two islets are perfect either to begin or to improve yourself because you’ll be either on the reef or on the sandbank and you’ll be able to set foot on the ground everywhere. With more than 14 years experience in the teaching of kitesurf and more than 5000 trainees who trusted us, we’ll be very close to you in your learning of this magic sport. We teach you the real techniques together with letting you know the good attitude to make kitesurf a real pleasure. All along your training, you’ll have trainers graduated in kitesurf by a state diploma BPJeps and they’ll give you their passion and their knowledge safely. To be sure to improve yourself quickly, we won’t accept more than 4 persons for 1 trainer. To ensure this quality, you’ll be given a helmet with a radio to make it sure you’ll receive every technical or security piece of information necessary. You can also have private lessons where you won’t set foot on the reef so that you can gain confidence in the ocean when you’ll go on deep depth spots later. Those lessons are given from Le Méridien beach where our base stands. You’ll be accompagnied by a security boat when you’ll first go out in the ocean. 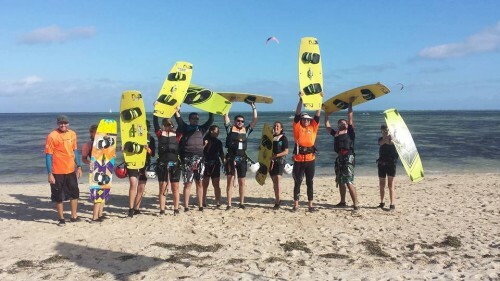 The school is equipped with a kitesurf simulator to make it easier to waterstart in either ways with a more precise decomposition of the movement. Our goal is to make our courses and your training a real first step towards autonomy to practise kitesurf as safely as possible…for maximum pleasure and minimum risk. Kitesurfing in New Caledonia is easier than in many other places thanks to the trade winds and the diversity of the spots. You can find out more on our school in a short film on Mgxprod, but also on our simulator by cliking here. The school is open everyday and the bookings are made at the shop ( 1 rue edouard Glasser ) and we can also make a pre-booking on the phone. You can pay in several times without any charges. Don’t hesitate to contact us. 10% DISCOUNT : FOR UNDER 25 year olds AND GROUPS OF 2 MINIMUM. For business groups and any GROUPS OF 5 OR MORE, please contact us. It is required that groups subscribe to the FFVL (French Federation of Flying Sports), or to have a public liability insurance statement issued by the insurance company specifically for kitesurfing. The French Federation of Flying Sports membership includes : public liability insurance, the federal membership, and the club or school membership. The public liability insurance covers costs resulting from the damages caused to a third party only, therefore we recommend that you take an individual insurance to complement it and cover eventual self-inclicted bodily harm. To start the lessons you must have a MEDICAL CERTIFICATE saying you are fit to kitesurf. Lessons include all kiting equipment and boat rides to the islands.